Could Gareth McGlynn be travelling home from New York to play for Derry City? KENNY SHIELS could turn to another member of Derry City’s old guard in 2016 with ex-winger and Brandywell favourite, Gareth McGlynn, understood to be considering a dramatic return. Following the signing of experienced striker, Rory Patterson last week and with ex-skipper, Barry Molloy in talks with the club, McGlynn’s return would provide a huge boost to the ‘Candy Stripes’ going into the New Year. 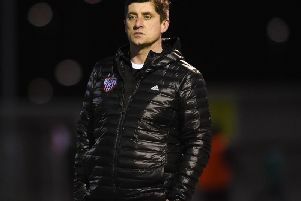 A product of the Derry City youth academy, the now 33 year-old Inch native enjoyed two spells at Brandywell from 2001 to 2011, sandwiched between one season at Bohemians in 2010. He then cut ties with Derry in December 2011 when he went travelling to Perth in Western Australia where he played for Stirling Lions in the Football West State League. His travels then took him to New York where he played for the Bronx-based Lansdowne Soccer Club helping the club secure back-to-back Cosmopolitan Soccer League titles. While Derry City boss, Kenny Shiels refused to comment on mounting speculation linking McGlynn with the club, it’s understood the player and his wife, Ciara, who is expecting the couple’s first baby, have been home for Christmas and are discussing the possibility of remaining in the North-West for the foreseeable future. McGlynn, however, is understood to have returned to the ‘Big Apple’ today where he’s currently employed with Veredus - a Recruitment Partner of New York City Football Club. The midfielder was part of the City team which embarked on that memorable European adventure in 2006 and his experience is exactly what Shiels is looking for in his new-look side for 2016. Meanwhile, Shiels will use a friendly match against Tobermore United tomorrow (Sat.) at Brandywell (kick-off 1.30 p.m.) to run his eye over Derry man, Dean Brown, who he rates highly.